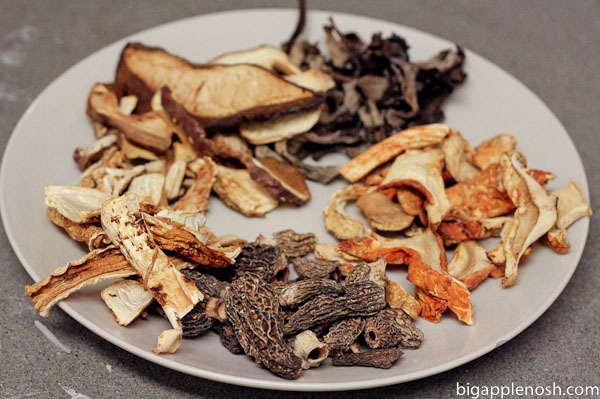 Clockwise from the bottom, that’s morel, matsutake, porcini, black trumpet and lobster. 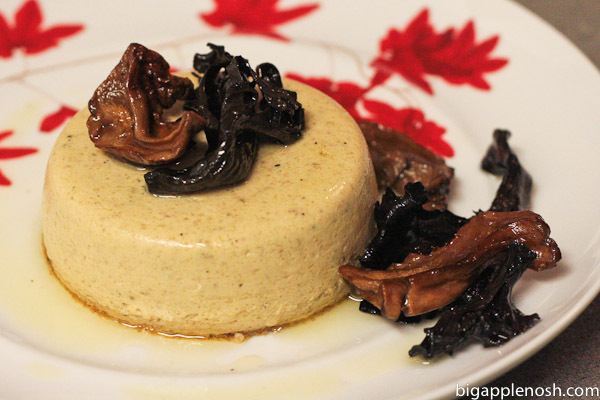 I used this opportunity to play with two ideas I’ve been wanting to try for a while – a savory flan and confit (I can’t say no to something cooked in oil! Mmmm). Using the flan base of cream and eggs, I used the porcinis to create a mouth-watering, umami-heavy flan. For the confit, I went with the light but flavorful lobster and black trumpet mushrooms. Enjoy! 1. Preheat oven to 350 degrees and butter 5 ramekins. 2. Using directions here, rehydrate porcini mushrooms, reserving 1/2 cup of liquid. 3. Saute shallots and garlic in butter over low heat, until shallots are soft. 4. In a food processor, puree porcinis and reserved liquid until smooth. Add shallot mixture, thyme, cream, yolks and cheese. Combine until smooth. 5. Pour mixture into prepared ramekins. 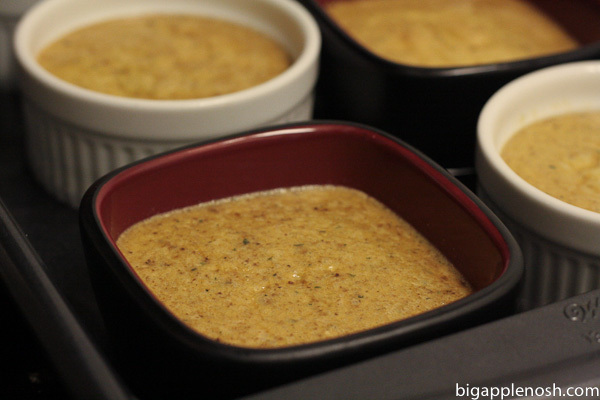 Place ramekins in 9×13″ baking pan and fill pan with 1″ water. Bake for 50 minutes or until middle of flans are set. Meanwhile, make the wild mushroom confit. 6. Using directions here, rehydrate lobster and black trumpet mushrooms. 7. Sprinkle salt and fresh ground pepper on mushrooms. 8. In a baking dish, combine mushrooms and herbs on hand. Submerge in oil. 9. Bake for 1hr at 350 or until mushrooms are soft. Discard oil. 10. Remove flan from ramekin and turn onto plate. Garnish with confit and serve warm! What a decadent and unique creation with mushrooms, looks like a winner to me! your dish looks so amazingly delicious. love mushrooms! So cool and a great use of porcinis! My dear, can we have dinner parties when I'm in NYC – I'll bring bubbly and dessert! this looks awesome. i love mushrooms. the husband doesn't. what the. OMG I've never had a savory flan before. This sounds amazing! Yum- I love mushrooms of every kind and have fond memories of picking mushrooms with my dad as a kid. looks sooo good! I always say "i never met a mushroom i didn't like" I hope you win the contest, you get more mushrooms and we get more recipes! You have a great super innovative recipe. It makes me think maybe I shouldn't have played it safe. Maybe I should have entered my black trumpet and lobster mushroom sushi. OMG, this sounds and looks amazingly rich and delicious. Love your site! Good to meet a fellow Marx Foods enthusiast! I'll be in the Big Apple in the beginning of November for the NYC Marathon. Any recommendations for good Italian in NYC? Looking for a delicious carb-feast before the run. Such a unique take on mushrooms! Can I possibly post a copy of this recipe in the recipe corner of my newbie blog please? I it is a NO, then it is ok. I hope you would allow me though. Congrats to Big Apple Nosh! Wow, that looks fantastic! I'm making it tonight. 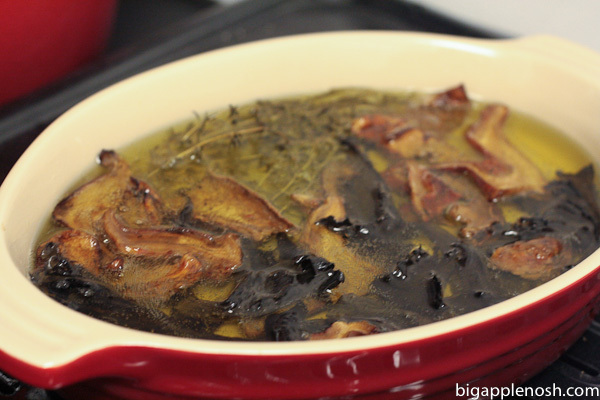 One question — why discard the mushroom-infused oil used in the confit? Seems to me that it would be delicious used to saute rice for risotto or to give mushroomy goodness drizzled over meat. Food Blog: Big Apple Nosh | Kansas City | New York | Restaurants | Recipes | Reviews | Happy Birthday, Blog!